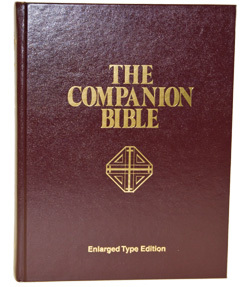 The Companion Bible is a new Edition of the 1611 English Bible. Published originally in six Parts it is now presented in one Volume and is a self-explanatory Bible designed for the general use of all English readers throughout the world. It is called The Companion Bible because its wide margin is intended to be a Companion to the text; and the whole is designed as the Companion of all readers of the Bible. This Bible has 198 Appendixes that contain a large amount of information bearing on the various questions raised by the phenomena of the Sacred Text. The order of the Appendixes is determined for the most part by the order in which the subjects are raised in the Text of the Bible. The explanatory information that accompanies practically every verse in this wonderful work is priceless and makes this Bible a must for any serious student as well as the Pastor and full time fellow servant.